Its been a while since the last post, mainly because we were all working hard preparing for the NMRA Train Show, which is being held this year in Cincinnati. I’m writing this post from the lobby of the Four Points Sheraton, which is next the the convention center where the convention and train show will be held this year. 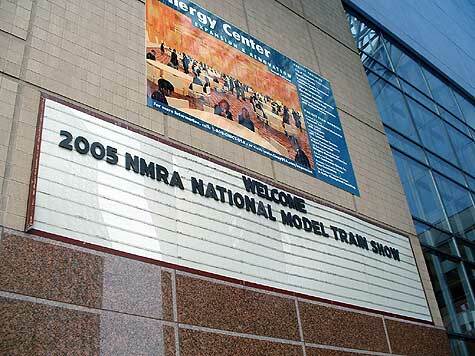 This is the first convention I have attended, and the first NMRA train show as well, so it is all exciting. Preparing for this has been quite an undertaking. We started building up stock about 6 weeks ago, while keeping up with orders, which was a bit of a challenge. The week prior to leaving was a blur of 14 hour days, but we managed to get it all together in time and found our way down here without any major problems. I decided to arrive a couple of days early to get a feel for the place. So far I am impressed, and we are looking forward to the train show that starts Friday morning. The hotel is crawling with model railroaders, which are all easily identifiable from their NMRA badges. I’m surprised how many “big name” people are here, seems to attract quite a notable crowd. While we were in the thick of preparing for the show, with impeccable timing, my hard drive crashed on my main computer. Fortunately I back everything important up online every night, so nothing critical was lost, but I did lose the stuff I needed to post new pictures to the blog, so I will not be able to post any shots of the fun until I return.